Housing | What The Sooke? As a volunteer on the Victoria Real Estate Board‘s Green Task Force, I was fortunate enough to visit a truly one-of-a-kind project in the Highlands District near Victoria yesterday. Ann and Gord Baird are the people behind Eco-Sense. Part lifestyle, part science experiment, part eco-pioneering, this truly amazing and simply fascinating home is nearing completion atop a rocky pinnacle in the rural municipality about 20 minutes outside downtown Victoria. What’s so special about Eco-Sense? The short answer: Everything. 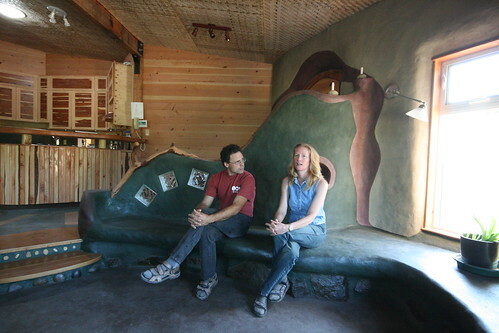 Ann and Gord have invested myriad time and energy to research, design, and build North America’s first code-approved, seismically engineered load-bearing insulated cob house. As if that wasn’t enough, the home features a BC Hydro grid intertie system, meaning that their electrical meter flows both ways. When their solar and wind energy array is producing more power than the home requires, it reverses the flow of electricity, selling the excess to Hydro. Furthermore, the house is also heated by the sun with a solar hot water system, which also provides the hot water for the plumbing. From the foundation up, every detail has been thought about and constructed in a way that is not only environmentally sound, but also economically so. 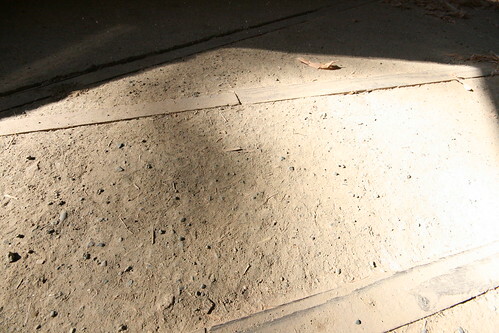 The foundation was poured with high fly-ash (a by-product of Albertan coal-fired power plants) concrete, and fabric forms were used to reduce waste wood. Total cost of forms? $300. What’s cob? 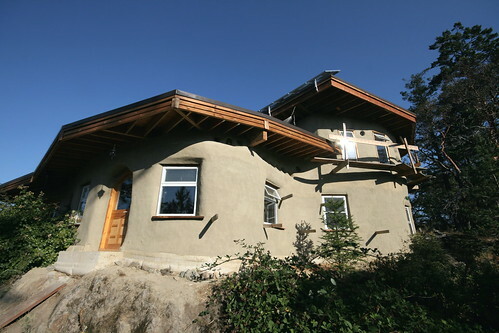 Cob is a building material; a mixture of sand, clay, and straw. Ann and Gord took this one step further and introduced pumice (lightweight, porous volcanic rock) into the mix to decrease the weight of the mixture, and to increase the insulative value. The cob is structural; there is no load-bearing framing in the walls of the home. One of the parts I found most interesting is the wiring and plumbing. Channels for the wires are carved out of the walls, the wiring installed and inspected by the city, and then simply filled over with more cob or plaster. It’s simple, seamless, and it works! 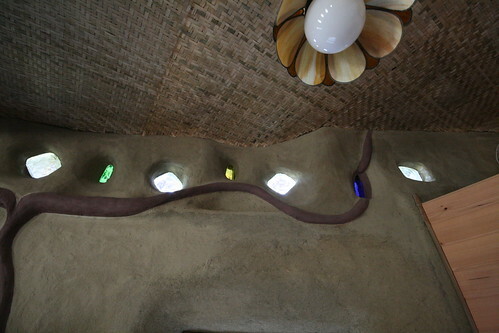 Not only is the cob functional, but when finished in a lime-plaster it is also beautiful. 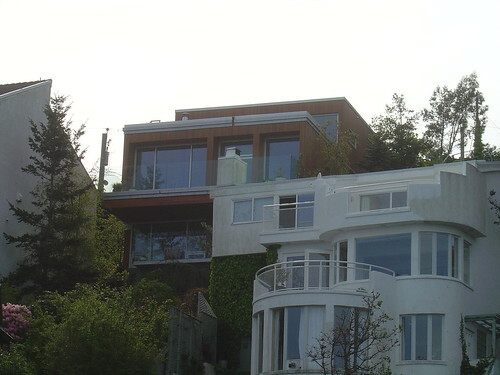 The house features lots of natural light. Light pipes direct sunlight from the roof into a dome-light-like fixture in the ceiling. Also, embedded in the walls are old glass bricks, and wine and beer bottles (my favourite were the blue ones). Other lighting is LED. While the bulbs cost considerably more than incandescent or compact fluorescent, they’ll last quite literally a lifetime, and use a mere fraction of the electricity. Ann and Gord explain about their home. Nearly all wood in the house is recycled, from local sources including the demolished Mayfair Lanes bowling alley (they even used the nails!). 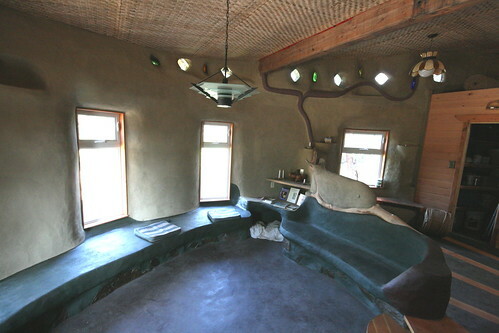 The house has a composting toilet (no water use), a rainwater collection system for gardening, and a greywater (from sinks, laundry, and showers) treatment system, which is also used for irrigation. It’s not easy being an eco-pioneer. Since no one has ever done the things that Ann and Gord have been doing, they have had to get each little step approved by the municipality. In fact, they had to shop around for a municipality that was willing to work with them to see this project through. Everything has been done to code, and that meant a few sacrifices. To appease the plumbing inspector, they had to install a flush toilet which has now been removed. They even had to install a $30,000 septic system, even though they aren’t going to be using it. Their toilet uses no water, and the rest of the wastewater is grey water, which is being treated and used for irrigation. Their modified cob mixture had to be strength tested in the lab. However, a nice by-product of building walls out of a non-flammable material is that you get a nice discount on your insurance. The low-slope roofs will be living roofs, planted with native species. This replaces the vegetation that is lost where the house sits, and also helps insulate the home and purify the rainwater which also flows more evenly and slowly because the soil retains some water before it drains out. Now, one thing that’s always bugged me about so-called “green” buildings is that they cost ever so much to build, that it’s hard to get people to buy into it. Every system in the Eco-Sense house has been evaluated on a triple-bottom-line basis. All things considered, Ann and Gord figure that their per-square-foot cost is around $140. Standard construction starts around $150 as I understand it. This is also including an estimate of their labour cost over 15 months, and a very pricey $60,000 alternative heating system. Therein lies the beauty of what Ann and Gord are doing. They are building Eco-Sense the way they see as best for the planet, but realize that other people might have different ideas. You could do more or you could do less. The point is that there are alternatives to frame construction for single family, two-storey dwellings. Recycled glass is used extensively in the home. lifestyle they want to live that has less of an impact of the natural environment, and they are demonstrating that it can be done very well while remaining with reach of the average family. Once municipal codes and building techniques catch up with the innovation that these two eco-pioneers are forging in the Highlands District of Victoria, it will become even easier and more within reach of the common man. Why should only the rich be able to afford to be nice to our planet when it comes to housing? For more information, check out Eco-Sense.ca. 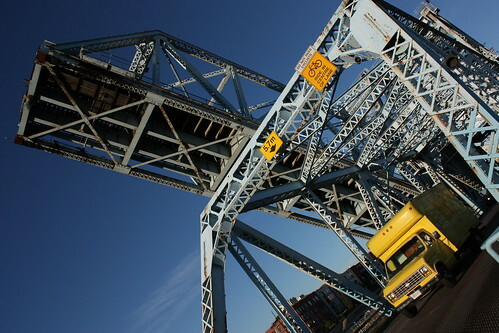 Ann and Gord offer fascinating tours for the general public, as well as private tours for technical/tradespeople. Many thanks to Ann and Gord for sharing their work with us. More photos can be found on my flickr page.